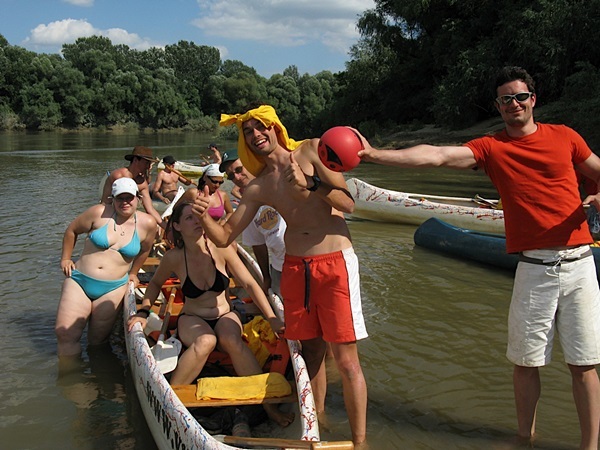 International Canoeing Tour In Hungary! Between 2008-2014 there were 12 similar tours running, with over 500 guests from 48 countries! See some references here. Mosoni-Duna is a protected side branch of the Danube. It is 20-60 meters wide, winding and has several islands. 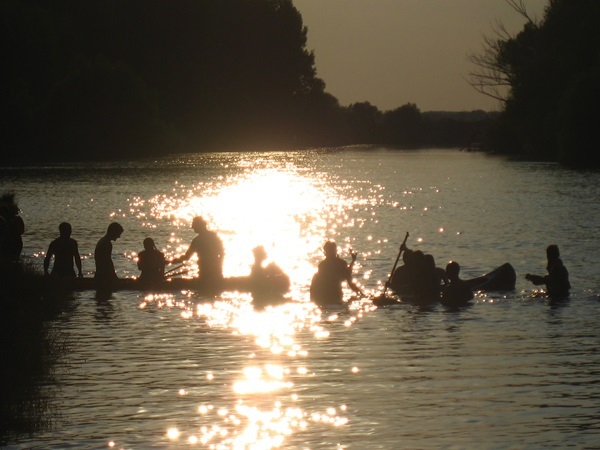 It has the best locations for canoeing tours in Hungary. Diverse landscape: beautiful forests, grassy fields, beaches with atmosphere and no ship traffic. 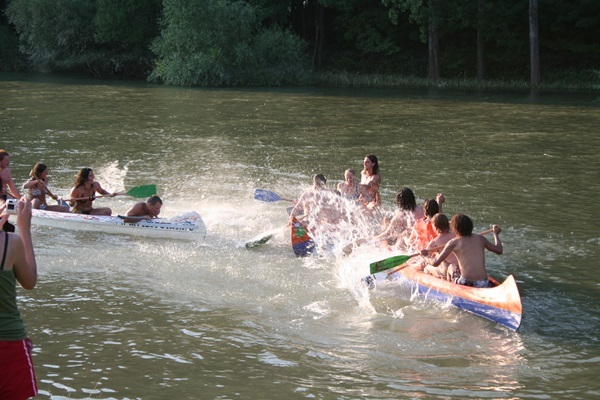 It isn’t only about canoeing, we will have enough time for some games, too: such as meta, volleyball, tail game, water fights and splashing. 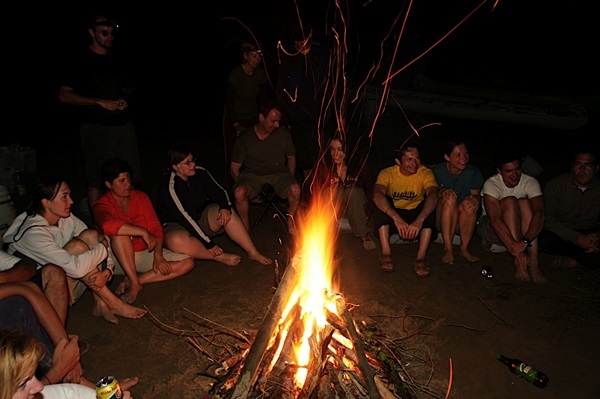 Lots of swimming and sunbathing at daytime, then making fire and cooking, playing the guitar in the evenings. The Killer Game goes on! The river is free from floods; the riverbank is pebbly and the campsites are pleasant. 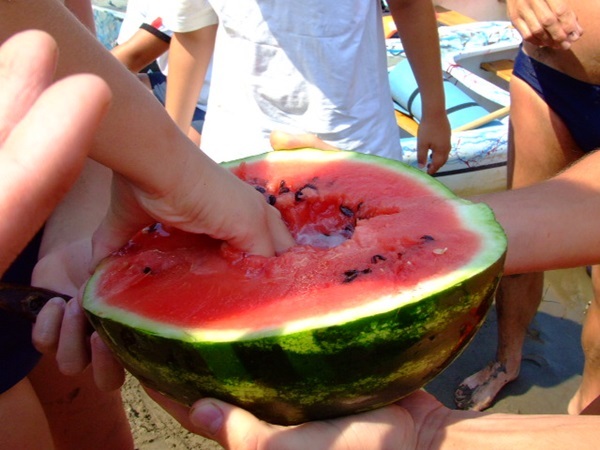 There are many exciting islands and grassy riversides, which are the scenes of lunch and fun. 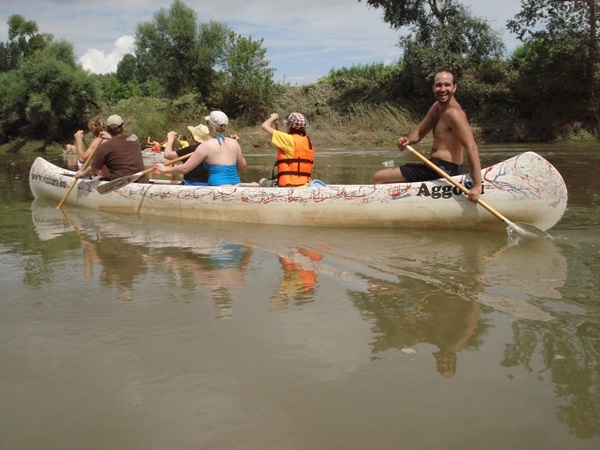 Speciality: we are making a short detour from our river and going sightseeing by canoe to the town of Mosonmagyaróvár. We are parking the canoes 100m from the centre! Farewell party right by the river in Győr! 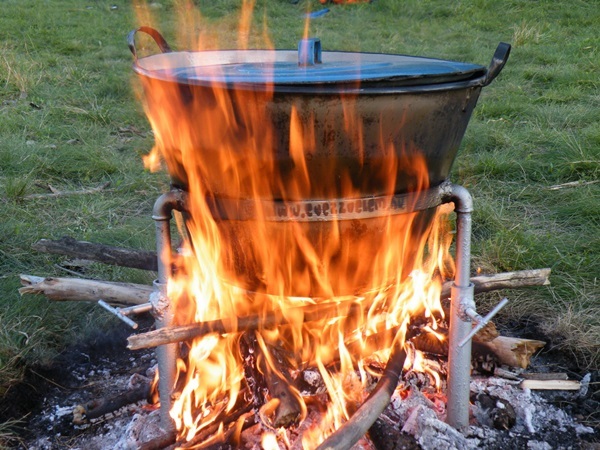 We take delicious food; enjoy the beautiful scenery, easy life and good company. It is a great way to relax and feel the FUNshine. Price – the more we are the less it costs!!! 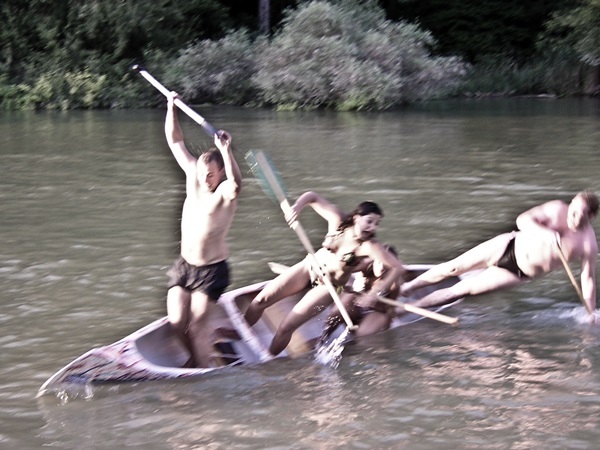 canoe, life-vest at your size, waterproof barrels, canoeing gears, etc. The island can't be visited anymore, but I found another campsite to fall in love with (I have fallen, already) and to spend 2 nights and the day-off there. Only Mosonmagyaróvár and Győr (used to be the 2nd and the last one) campsites ramained, the other 3 are new ones. I had 8 versions and love the final one. START: We travel by train from Budapest to Mosonmagyaróvár as a group, please buy your own ticket. We will leave Budapest around 8 am (I am going to email the details a few weeks ahead) and the journey takes maximum 2 hours. Then take taxis to the riverside (1 euro per person). We spend the first night here, but programme starts instantly. We are going to canoe that day, too, for about 2 hours. 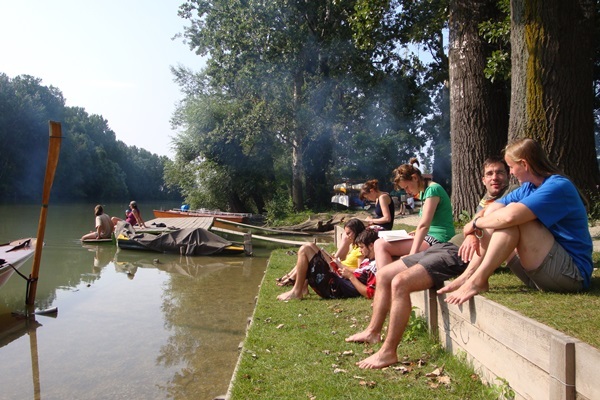 If you decide to arrive at the starting point of the tour independently, please meet us at the riverside in Mosonmagyaróvár. Address: Mosonmagyaróvár, Strand utca 15. and please be there not later than 10.00-10.30. (Arriving to Mosonmagyaróvár from the other direction, the best option is to take a taxi. Besides the address tell the driver going to "Itató" spell: "e-tuh-toe". Please let us know about your means of transport via the application form. The town of Mosonmagyaróvár is near Vienna/Bratislava and is on the railway line Munich-Vienna-Mosonmagyaróvár (start of the trip)-Győr(final stop of the trip)-Budapest. FINISH: we sleep in Győr on Saturday and after a bit longer rest than usual (after the party) walk 30 mins to the railway station (not missing the best ice cream in town) and leave sometime between noon and 1 PM. Train journey to Budapest is 60-80 mins. Please, buy your own ticket for this leg of the journey, too. Buy your ticket well ahead, as masses go to Sziget Fesztivál on the 5th August. If you join us on the train on either leg of the journey between Budapest and the riverside, we transport your stuff by car. The price does not include the train tickets, which is an expected 6400 HUF (21 Euro), 3200 HUF/11 Euro with EU + Iceland, Lichtenstein, Norway and Switzerland student cards. (Student cards, which give you discount: with your name written, handed out by an educational institution, with the name and centre of the institution and validity. Student IDs handed out by student organizations or travel agencies are invalid!) That's the most reliable info one can have and if you are uncertain about your legitimacy to have this discount, it is probably better to buy a full-price ticket as Hungarian railway ticket inspectors have a rather unflexible reputation in discount matters. In case you are vegetarian please state it in the online application form, we can supply you with veggie food. We have planned this tour to be really relaxing and fun for you. 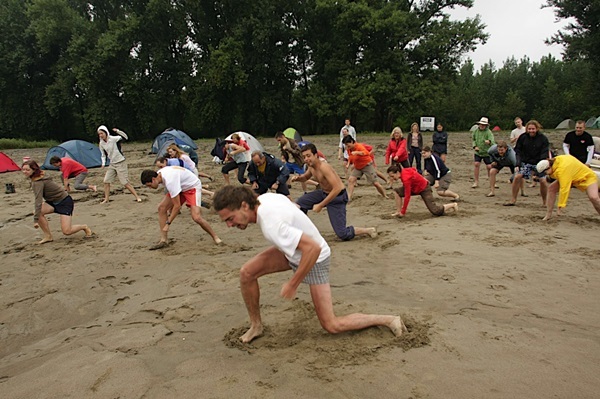 The focus is not on the physical performance but on spending time together with old and new (couchsurfer and non-couchsurfer) friends and having FUN. Application is valid after depositing and application. Further details will be emailed after application.